Our Keller, Hurst, and Southlake offices proudly serve the Coppell area. Although Coppell is thought of as a relatively young city (incorporated in 1955), its roots can be traced back to the early 1880's. As the town developed, it went through several name changes. In 1890 – it became "Coppell", probably after George Coppell, who was a prominent New York businessman closely associated with many railroads. So influential was the railroad in those days that the name of the train stop became the name of the town, and in 1892, Gibbs officially changed the name of its post office and town to Coppell.â€¨Transportation has played a key role in the history of the City. The Cotton Belt Railroad (part of the St. Louis and Southwestern Texas Railroad) established the "Gibbs Station" in the community in 1889, providing needed transportation for the area's many farms. The railroad was the major form of transportation into the community until the 1920's, when paved roads and automobiles became more prevalent in the area. By the 1930's Coppell had a population of slightly over 400, almost entirely farmers and their families.â€¨â€¨One of Coppell's selling points is its close proximity to DF/W International Airport. 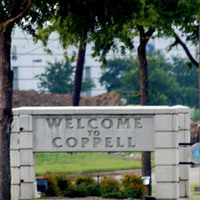 Part of D/FW's property is located within Coppell's city limits. Our podiatrists specialized on the science and art of medical-surgical management of foot and ankles, and guarantee the foot and ankle health of your family. We concentrate on the prevention and treatment of foot and ankle complications like Achilles’ tendon problems, ankle instability, ankle sprains, arthritic foot and ankle, athlete’s foot and bunions. Our podiatrists will treat your calluses, corns, crush injuries, diabetic foot, fungus toenails, heel spurs, ingrown toenails, and injuries. Our team of experts corrects flat feet, hammertoes, and plantar fasciitis. Other conditions like metatarsalgia, neuromas, warts and wounds are also given appropriate medical attention. Plus, older adults will benefit from our state of the art geriatric foot care services. Our podiatrists at our Keller/Fort Worth, Hurst and Southlake offices do not simply focus on the diagnosis and treatment of your foot and ankle problems but they also provide you with sufficient knowledge on its prevention and identification. At Academy Foot and Ankle Specialists, each foot doctor makes time to explain to you everything you need to know about your foot conditions. We are open from Monday to Friday, 9 am to 5 pm. For more information on our services and office locations, call 817-424-3668 (FOOT) or explore our website for more information.